You'll love how this Homemade Apple Cider recipe mulling on the stove fills your house with the comforting aroma of apple, orange, cinnamon and cloves. Wash apples and the orange, and then roughly cut into quarters. (Don't worry about removing peels, seeds, or stems.) Place in a large stock pot. Add cinnamon sticks, nutmeg, cloves and allspice. Cover with water, filling the pot until it is nearly full. (I left about 2 inches of space at the top of my pot.) Bring to a simmer over high heat, stirring occasionally. Then reduce heat to medium-low, cover and simmer for 2 hours. 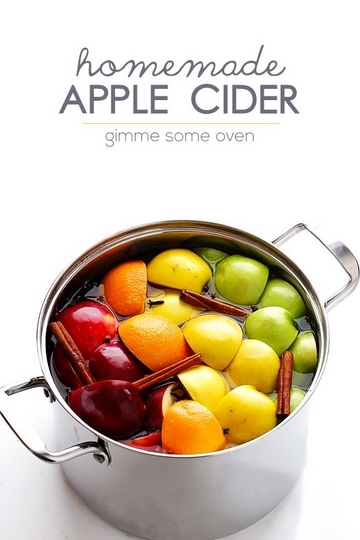 Strain out the apple cider into a clean pitcher or pot. To get the maximum juice out of the apples, you can press them through a fine-mesh strainer or strain through a cheese cloth. Stir in your desired amount of sweetener until it is dissolved.